One of the reasons I started my blog was to keep track of recipes. I wasn't in the habit of using cookbooks or recipes, nor was I likely to remember exactly what I added to a dish to make it repeat-worthy. I wanted to force myself to keep a record of what I cooked so I could have a catalogue of recipes I could return to and make again. I recently had an old recipe pop into my mind, and I was able to look it up and make it for dinner instead of spending time trying to recollect what the ingredients were. It was easy and delicious so I'm sharing it again. The recipe was inspired by a cookbook review I did for Peta's Vegan College Cookbook intended to help college students with limited resources (like money, ingredients, equipment and time) feed themselves in a dorm or apartment. Although most of the recipes were not exactly my taste, a few, with some adjustments, were actually quite good. 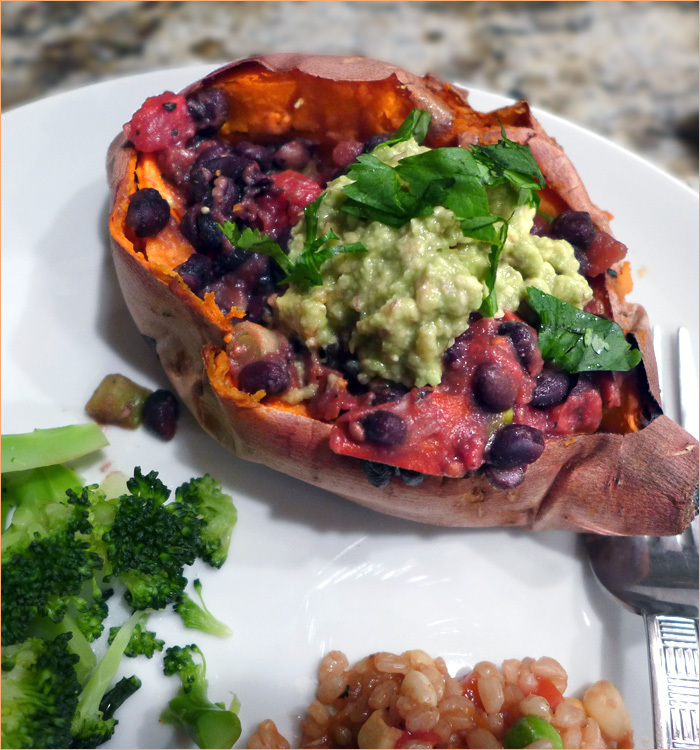 Spicy black bean and tomato stuffed sweet potatoes was one recipe that has stuck with us. My adapted recipe first appeared on the blog May 28, 2009 on a post describing the day I became a vegetarian. Now, eight years later, I'm re-sharing the recipe after making it and loving it once again. I'm changing the name from stuffed sweet potatoes to stuffed yams to reflect what we actually use. Update: I looked up the difference between sweet potatoes and yams and learned that my memory on the subject failed me. I should have done what I originally planned and written about it, but I was too lazy. The garnet yams I like so much are actually sweet potatoes. Sorry about the misleading title. The two vegetables are quite different. Here is a link to find out more about the differences between sweet potatoes and yams. There are also nutritional differences and the article provides a link to learn more. Slice a very small piece from the end of each potato. (Or, you can prick them all over with a fork.) Bake at 425˚F for about 40 minutes or until nice and soft all the way through. You can bake them right on the oven rack. When they are ready, place them on a plate to cool slightly while you finish up the filling. Cook the onion, garlic and oregano (and jalapeños, if using fresh) in the oil (or broth or water if you don't use oil) for one minute. Add the beans, tomatoes, canned chilies (if using), paprika, salt and pepper. Heat gently until hot. Stir in two tablespoons lemon juice, and the parsley or cilantro. Taste for seasoning. Fill the pockets with the bean mixture and top with avocado. 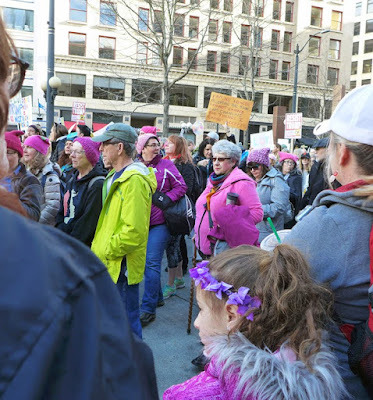 I don't usually like to bring politics into the blog, but I'll tell you, it's been a nightmare week watching the horror happening in the White House, and I'm so glad I had the opportunity to participate in the woman's march to experience the joy of knowing first hand there are so many people who believe in the core values our country stands for. 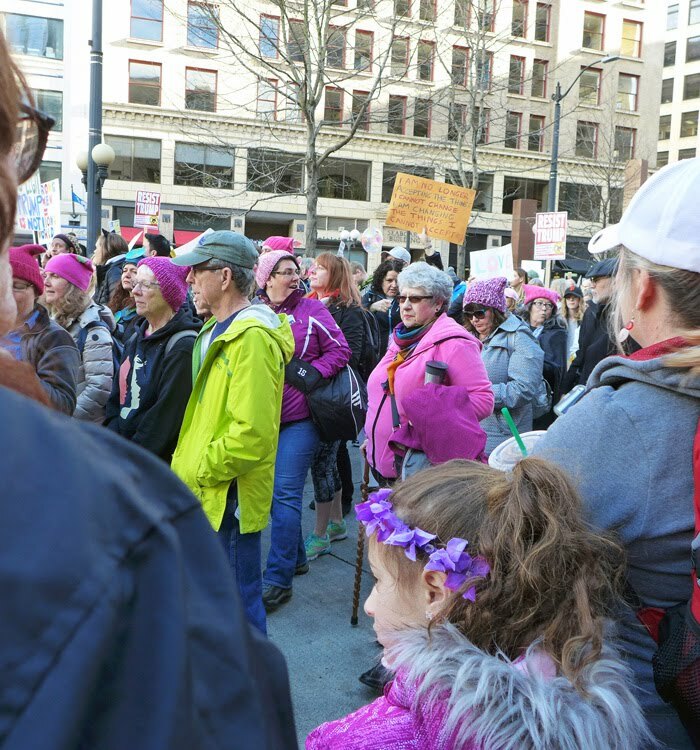 The Seattle march organizers final head count was 200,000. And Seattle folks are continuing to protest about the refugee ban. 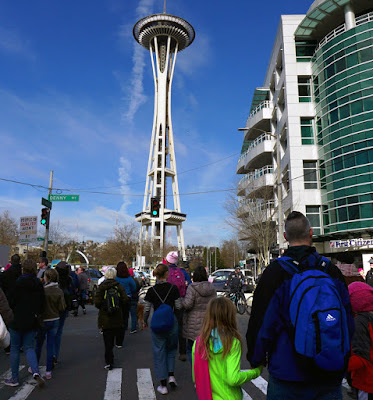 Were you at a march? BetaOats: "A non-dairy yogurt-style experience"
I recently had the opportunity to sample a new, fermented, yogurt-like product being made in the Seattle area. BetaOats is 100% vegan, probiotic, gluten free non-GMO, high in beta-glucan, high in oat fiber, soy and coconut free, allergen free. 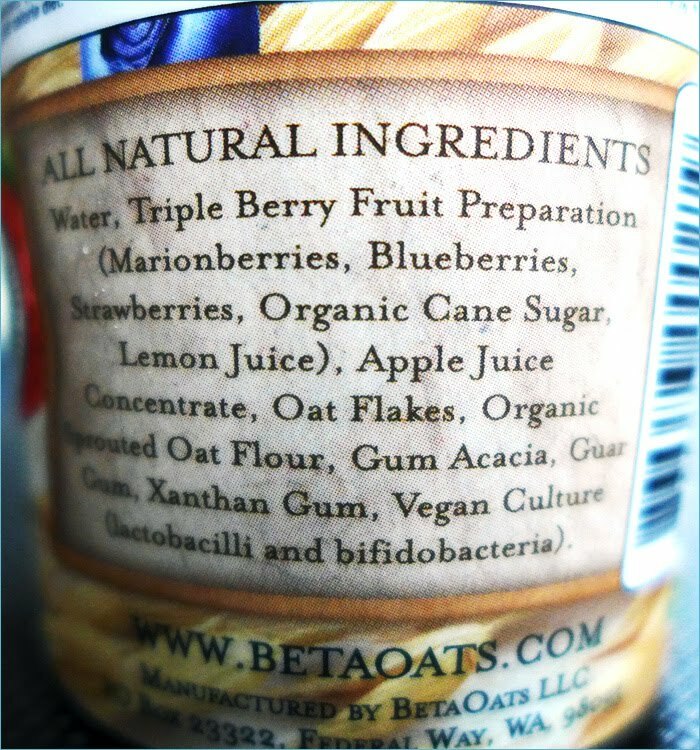 Here's what the BetaOats creators have to say about their product on their Web site: "Oats are a superfood. Not only are oats delicious, but they are healthful. They are 100% whole grain, packed with soluble fiber beta-glucan, and rich in vitamins, minerals, and antioxidants. People from around the world have been using oats as a staple in their diets in various forms. A traditional method of fermenting oats, found in many cultures, produces a yogurt-like product, enhanced in flavor and nutritional value. Such fermented cereal yogurt-type snacks are called vellies. 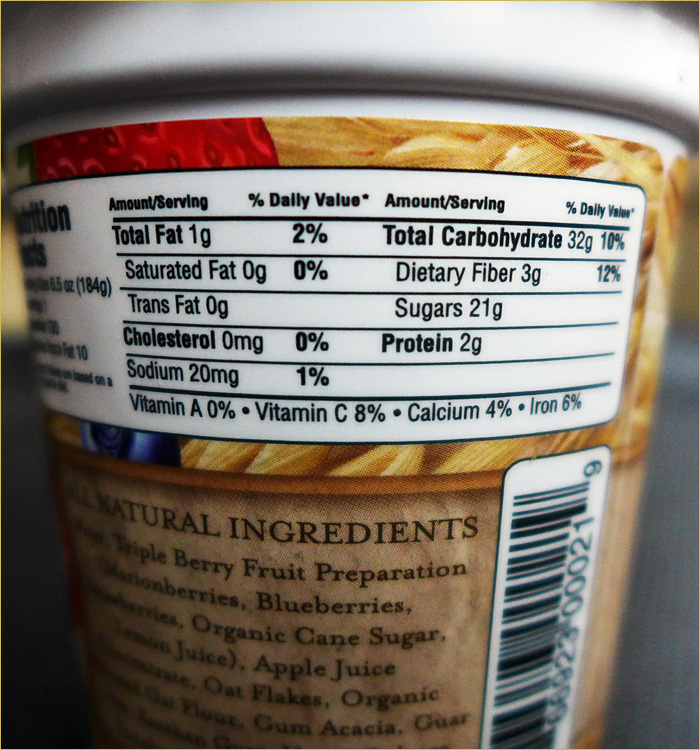 Each package of our oat vellie contains 6.5 oz of oat goodness, prepared with only the essential natural ingredients, no preservatives or gmo's. Naturally high in beta-glucan, BetaOats vellie combines the beneficial live bacterial cultures of fermented oats, the creaminess of your favorite yogurt, and the refreshing flavor of tree-ripened fruit sourced from the Hood River Valley in Northern Oregon." I loved the taste and texture of the product. 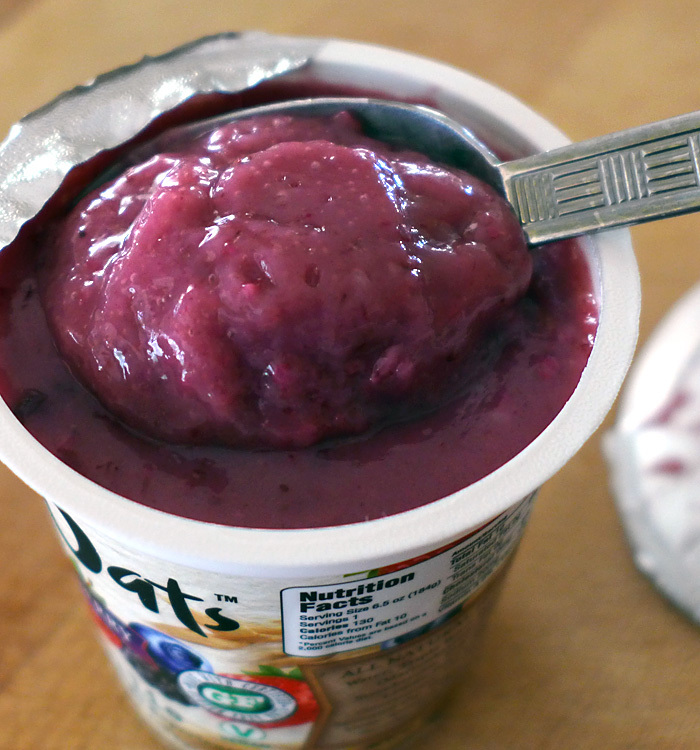 It didn't have the tang or consistency of yogurt, but was more pudding-like, with a thickened, velvety quality. Although the number of grams of sugar seems high, the taste wasn't overly sweet. It was a perfect balance of tart berries and sweetness. 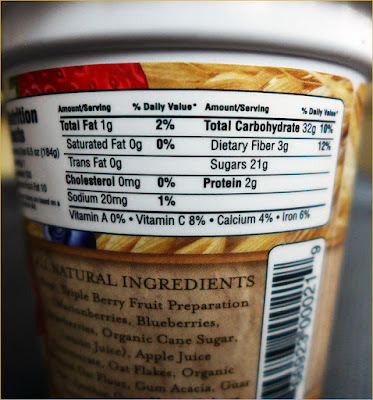 It's true I enjoyed my sample cups of BetaOats, but I tend not to buy foods with added sugar, and I usually avoid additives like xanthan gum. BetaOats seemed more like a dessert to me, and as such would probably be a much healthier dessert choice than most sweet products people select — especially for kids. It was extremely appealing in both taste and texture, very low in fat, and is a good source of probiotics. I realize that sweetened yogurts are extremely popular, and it's usually easier to find a sweet variety than an unsweetened one. Everyone has their own opinion about what should or shouldn't be in their food, which is why I provide ingredient and nutritional information about products I review, as well as information about taste and appeal. If you live in the PNW, and have access to Vegan Haven in Seattle, or Marlene's Market in Tacoma or Federal Way, you can try the delicious, new BetaOats. Or, if Beta Oats appeals to you, and you can't find it in a store, you could request that your local stores (PCC?, Whole Foods?) begin to carry it. Have you tried BetaOats? Would you be interested in a product like this? 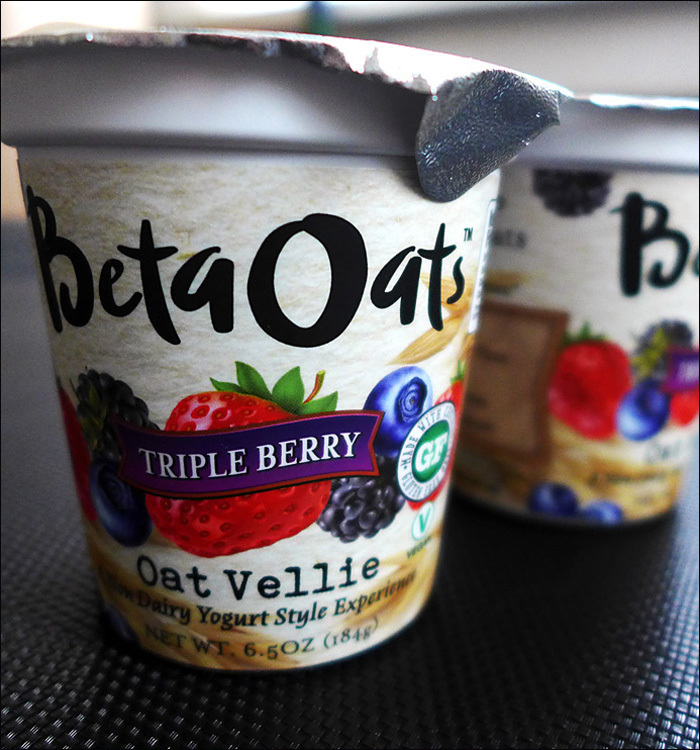 Disclosure: I was provided with two free cups of BetaOats to try. All opinions are my own except as stated in the review. I wasn't paid for my time or opinion.